I was once on the cover of Sports Illustrated. It was March 2016, the Florida Gators had the best men's basketball team in the south region of the NCAA, and I went with Bill to a cover shoot I hadn't planned on attending. In the weeks leading up to the NCAA tournament, we had spent a lot of time with the Florida Gators for a multimedia on their senior leadership. We went to practice, class, followed them around campus, and back to their dorms and apartments. We went to dinner with them, on dates with them, and to volunteer activities around the community. The Gators that year were a rarity in college basketball. They were led by four seniors - Scottie Wilbekin, Patric Young, Casey Prather and Will Yeguette - who had been together since day one on UF’s campus. Many of the top schools at the time - and still today - are full of “one-and-done” players; talented athletes who come to college for the mandatory one year before entering the NBA draft. But Billy Donovan and his #1 seed Gators were the opposite of that trend. Each of the four seniors had been through the highs and lows of a full college career. They had - in many ways - grown up together. 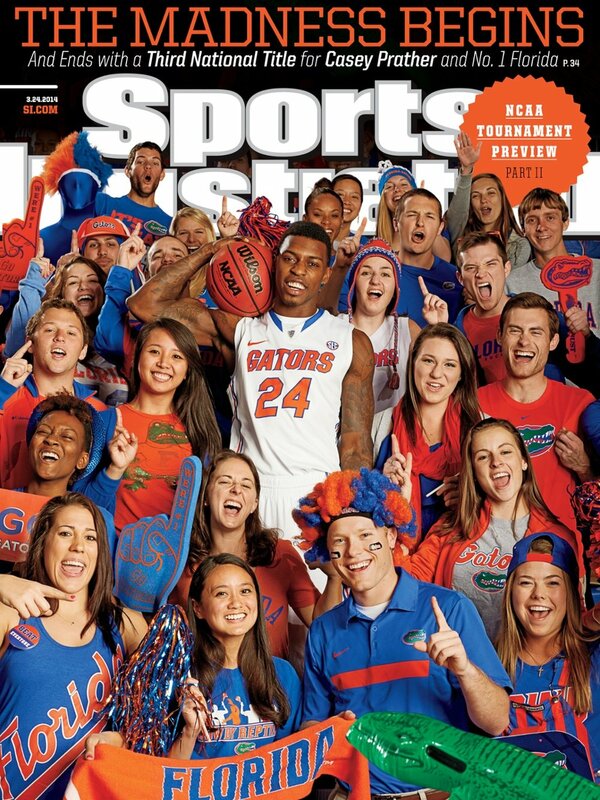 After the multimedia came out, Sports Illustrated had another assignment for Bill - a cover shoot with the Gator’s top scorer, Casey Prather. Every year right before March Madness kicks off, Sports Illustrated does a series of regional covers highlighting the best team from each region. In 2014 the Florida Gators werethe favorite team not just in the south region, but in the nation. The idea for the cover was to show individual players from each school surrounded by a sea of excited fans. It was a setup shot, intended to feature the fans as much as the players they cheered for. When the assignment came in, I didn’t plan on going. We had been working a lot that spring - most of it with the Gators - and I was tired. There were plenty of students at UF who could help Bill set up the lights, including our intern at the time. Then, at the last minute, I decided to go along for the ride. I didn’t go as an assistant or in any official capacity. I just went as Bill’s friend and a Gator fan. We had spent so much time with the team that spring that not being part of the cover shoot seemed almost rude. We left Jacksonville early that morning. A couple journalism students met us in Gainesville along with our friend Sara Tanner, another UF alumnae. Sara had come prepared with bags of props - pompoms, hats, foam fingers, t-shirts - anything we might need if a fan showed up under dressed. Denver Parler, the men’s basketball sports information director at UF, met us at the O’Connell center and helped us set up. He had sent out a discreet social media blast asking students to come to the O’Dome at 1pm for a “special project” with a member of the men’s basketball team. The only problem was that it was spring break, meaning almost no students were still on campus. When 1pm rolled around, we were slim on students. Denver went and gathered every student intern he could find in the athletic department and told them to change into their favorite game-day gear. Still, the portrait just wasn’t quite coming together. Getting every student to scream, cheer, smile and yell all at the same time AND with their eyes open is no easy task. After a few lackluster frames, I put on my orange and blue, grabbed a foam finger, and headed to the center of the group. I asked Bill if he was ready and he nodded. I started screaming and the rest of the crowd joined, yelling and laughing. When the Elinchrome strobe popped, I stopped, waited a few seconds for the power to recycle, and started again. After a few frames, when I thought the fans were appropriately rowdy, I jumped out of the picture and continued cheering next to Bill as he shot. When the cover came out, I was surprised they chose a picture with me in it. Clearly, my excitement was infectious. Looking back, I can't believe I almost passed up a chance to cheer my favorite team into March Madness with some fellow Rowdy Reptiles. The 2017 tournament begins tonight, and you can bet I will again be cheering on the Gators as they tip off their tournament this afternoon against East Tennessee State.